Volusion just like Shopify and Woocommerce is an e-commerce store creation software that’s built on ASP platform. It lets you create online stores with ease. But then, of what use is an online store without proper search optimization? This is the aim of this post, to guide you on Volusion SEO and the best ways to optimize a Volusion store. Before we dive into the lists proper, I’ll like to say a thing or two about Volution software. 3. Update Metadata for your Store and Special Pages. Volusion software is a premium eCommerce website creation software that’s built on ASP.net. It is modern and comes with marketing, tracking analysis, and abandoned cart report features. With Volution online store creation software, you can create unlimited products, automate shipping, online support, and easy order checkouts. On top of these features is – the ability to add a blog section to your online store, do SEO and products listing optimization. There’s tons of guide and resources to help anyone create an amazing business with Volusion software. If you have an old store that’s built with Volusion software or planning to do SEO for your new online store; these 10 tweaks will help you do proper Volution SEO irrespective of your targeted audience. This is one of the first steps to optimize your online store. Assuming that you own a fashion store for T-shirts, watches and shoes and one of your store item is LA Customized Tshirts. After enabling SEO friendly URLs options, the URL for the product in bold is going to be //myonlinestore.com/La-Customized-Tshirts-p/xxxxx.htm instead of //myonlinestore.com/product_details.asp?ID=xxxxxx. This would ensure that your keywords are passed along with the product’s URL. Do not forget to note down your Sitemap URL at this point. 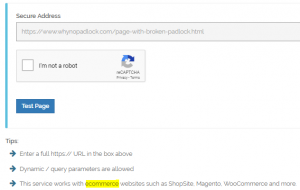 It is usually https://www.mystore.com/sitemap.xml, and the check boxes for canonical links and Hyphens (-) use must be ticked as well. This is one of the fastest ways to index your online stores quickly. Apart from faster posts/page indexing, you’d get to see: index coverage error notification, search improvement tips, ranking position, and other important optimization metrics. How to submit your sitemap to search engines? First things first, you’d need to take note of your sitemap URL which is normally https://www.mystoreurl.com/sitemap.xml. After that, you must verify your website, and then submit the sitemap URL to them. The link to verify and submit your store sitemap URL to Google search console, Bing webmasters dashboard, Yandex console and etc. is provided below for your learning. For Google search console use this URL. For Bing webmasters dashboard use this address. To submit to Yandex.Webmaster dashboard use this page. For other robots.txt compliant search engines such as ask.com, Baidu and etcetera, add your sitemap URL to the robots.txt file by using the guide below. Step 1: Login to your volution store’s admin dashboard. Step 2: Hover over marketing ==> SEO ==> find robot preferences and click on it. Last Step: Modify the contents with the one below and save changes. Remember to change the mystoreurl.com part to your store address. This is as important as the first. 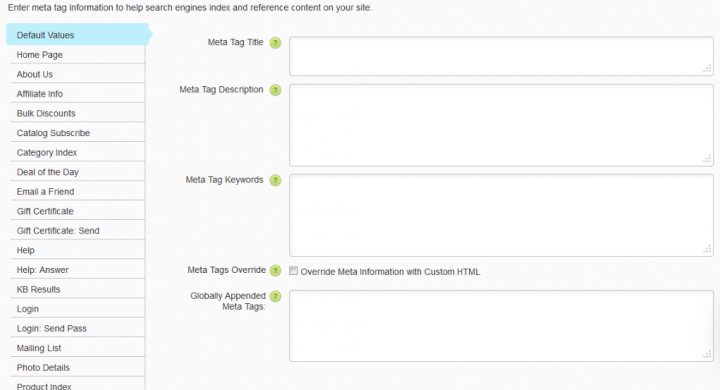 Having unique and custom metadata such as: meta description, tags and keywords helps users from search engines to understand your page contents. Optimizing the contents of this section correctly can grow your search traffic by over 20%. This is largely so because CTR and dwell time is one of the major ranking factors in modern SEO. I strongly recommend that you use slightly different values for your Home Page metadata and that of Default Values. This is because – the details entered in the default values section would populate help pages, policy pages, article pages, gift pages, and other pages that aren’t as important as your store homepage. Getting this right will reduce the risk of having so many pages with duplicate titles and/or duplicate meta descriptions. You can also create custom metadata for other pages from this window. Note: To access this windows, you’ll need go from ==> admin dashboard ==> marketing ==> SEO. In modern SEO, load time and responsive pages are as important as CTR and image alt optimization. Although Volusion software is CDN ready, having lighter images would do you many good. To reduce extremely heavy images losslessly before uploading them to your Volusion store, use tools like tinypng.com. Bulk upload and save the compressed images to folder you can easily remember. Use the compressed images for your store and product pages. Another important aspect of image optimization is the use of proper alt text and title description. It is important for you to use a unique and concise description in the alt text filed for every single product image you upload. This would help pass on the right description and keyword along with your images. All in all, every product page must have a unique description that’s not found anywhere else on your online store, along with links to similar category pages. To edit products SEO metadata for existing product pages: use ==> admin dashboard ==> Inventory ==> products. Assuming that for some reasons, a particular product line is discontinued and they’re well ranked in search engines: It is an important rule of thumb to have them redirected to useful/similar page instead of having them hit error 404. For example: there’s a Real Madrid customized wrist watch that’s no longer sold and deleted, but other sport watches are still available for sale on your store. You can simply redirect the former URL to the best-selling sport watch or the base category for sport watches. This way, the link juice is passed and users are presented with an experience that’s better than showing an error 404 page. To redirect dead, but ranked pages correctly, follow after the simple guide below. Next Step: Hover over Settings ==> Maintenance ==> find manage 301 redirects and click on it. Step 3: Enter the dead page’s URL tail (without including the primary domain name) in the source path and the logical page you’re redirecting to in the target path as seen in the image below. Step 4: Repeat same for other erring pages and click on save to complete. Only deleted or non-existent pages can be redirected. Always redirect product lines you’ve discontinued to the most reasonable pages. You can use the 301 redirection tool to fix other error 404 pages such as the ones caused by migration, category page deletion, domain/URL changes, and etc. Volusion SEO can’t be 100% complete without proper content marketing. Even business portfolio websites uses blog to show their expertise and/or rank for important keywords. Having an active blog section for your online store would not only improve ranking, but engagement, faster indexation, and improved social signals. The easiest way to have an organized blog on Volusion is to – create a Blog category and then bud all of your new blogs as sub-categories under it. Proper metadata must be entered for the blog category and sub-categories. Remember to use detailed titles and description for your blog pages. Having rich media contents such as Videos, GIFs and photos in your blog pages can increase user engagement by over 15%. Users are more likely to share engaging contents with rich media on social media than they would for boring, soulless contents. Remember to make only blogs that are 100% related to your brand/products: that way, you build authority, trust and returning visits. While this is not as important as the other 6 Volusion SEO tweaks above, it is necessary for older stores that were formally on http address. Identify the pages with such issues. Edit them and switch to html mode while on the edit window. Replace all instances of http with https and click on save/publish to update the page. To fix broken links, identify the erring pages and update/remove the dead links or simply redirect them (for internally broken) to most logical pages. Social media networks are great source of traffic for most websites, including online stores. Having social media sharing buttons on your blog and product listing pages would help skyrocket your store traffic. This is because social signals do improve search engine ranking and can also bring steady direct visitors to your online store. Having Facebook, Twitter, Pinterest, Linkedin, and Google+ social media sharing button is a good stand point for most online stores. If the default sharing buttons that’s integrated with Volusion software isn’t good enough for your social media sharing needs, you can opt for any of these free social media sharing services. This is another important aspect of online store optimization that’s mostly ignored by some businesses. Having an engaging social media pages for your online store would improve ranking in many ways than one. You can create a social media page for your business by visiting the official homepage of these social networks. Facebook, Twitter, YouTube/Google+, Linkedin, and Pinterest are the top social networks to consider for new businesses. You can use these free tools to automate content sharing on your social media pages. Google analytics is unarguably the best tool for this job. While you’ll normally get regular update on your website performance from Google search console, it is important to have one you can monitor on the daily. Best traffic source and etc. All in all, having Google analytics on your online store would help know what works and what doesn’t. The guide to install Google analytics with e-Commerce tracking code on Volusion stores can be found in this page. It is practical and easy to carry out. That’s all we’ve got today on Volusion SEO and how to optimize your online stores in 2018. We are confident that these tips would help you do modern SEO on your online stores. The search optimization and Sitemap submission part is to help you see various aspects of your site through the eyes of search engine crawlers and do proper optimization where and/or when necessary. PPC and other forms of paid traffic can come in handy for new/growing stores. Have questions or other tips to share on Volusion SEO? Please do let us know about it in the comments section below. Nice write-up on eCommerce SEO. It’s really intriguing.